Drifting bait for striped bass in fast-moving water is an effective fishing technique for catching stripers on light tackle, and it's fun. One of my favorite places to fish for striped bass is near an inlet with a fast-running current during the incoming and outgoing tides. 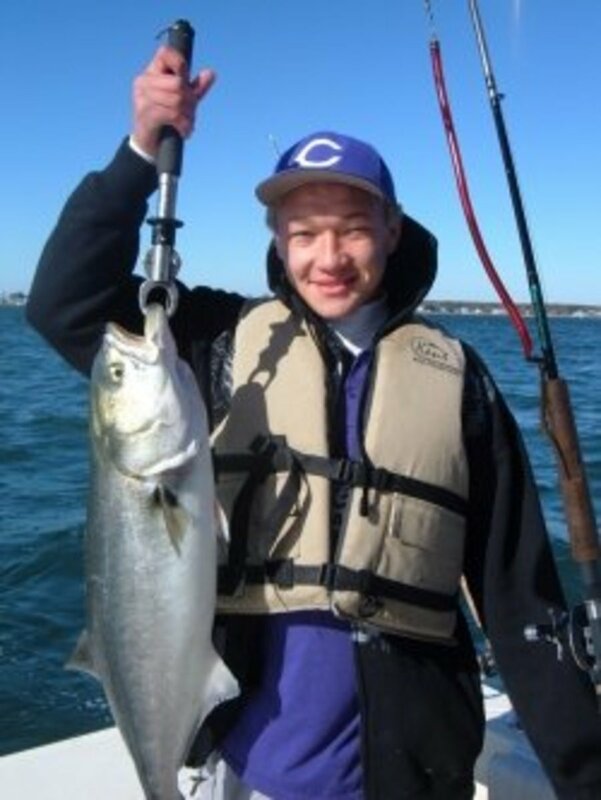 Stripers follow schools of bait fish and search for sand eels, and while schoolie stripers offer most of the fishing action, the keeper-sized fish also move with the tides. The current runs fast enough to require a fair amount of weight to hold the bait near the bottom with a traditional slip rig. So instead of weighting down the bait with a large sinker, I use a Cast-Drift-Retrieve technique on light tackle. Drifting fresh bait through the currents is an easy yet very productive technique for catching striped bass. My favorite rod for catching striped bass is a 7' medium weight pole rigged with 20-lb test braided fishing line. To reduce line twist, I tie a stainless steel barrel swivel to the end of the braided fishing line, and use a snap ring to attach a stainless steel snap swivel to the barrel swivel. Then, I make a 24" leader from 20-lb test mono-filament line that is tied to a #4 circle hook, and connect the leader to the line with another snap swivel. When conditions allow, I do not use sinkers or any other tackle. 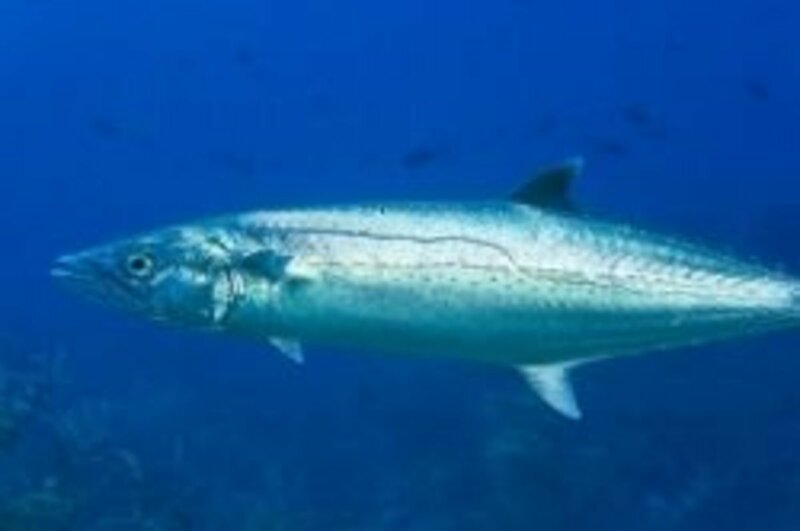 Bait the hook using a piece of herring (1/2 or 1/3, depending on the size) or an equivalent size chuck of mackerel or other baitfish. Fresh bait is preferred, but frozen bait will work if it is the only option available. The weight of the bait is enough to carry the cast and then take the hook down through the currents towards the bottom during the drift. 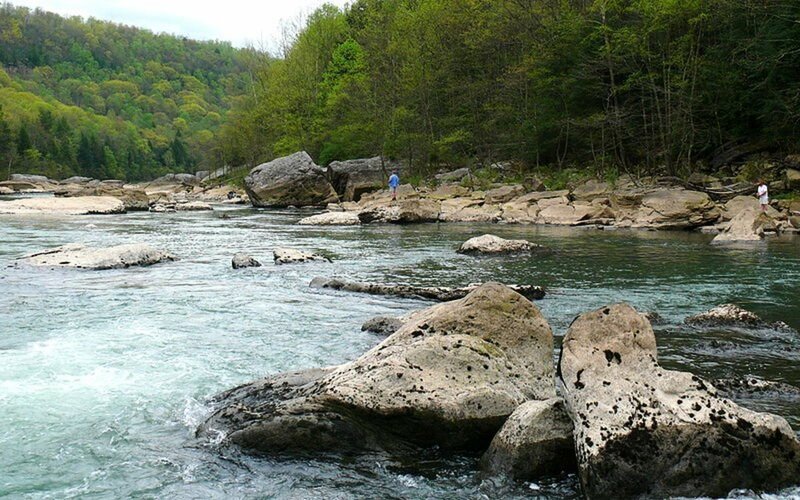 Cast upstream and then allow the bait to drift back downstream through the current. After casting out, leave the bail open, and the line will free-spool as the bait is carried along and downward with the current. Use your forefinger to control the line payout and the drift. If the current moves the bait along too swiftly to sink, try adding a split shot or two about 18 to 24 inches up the line from the baited hook. If the bait still drifts by just under the surface, more weight is needed, but add just a little at a time until the baits sinks properly. If you start catching crabs, there is too much weight and the bait is drifting too slowly along the bottom. Ideally, the combination of bait and split shot (if needed) will carry the hook downward through the current and bounce it along the bottom for the better part of the drift. 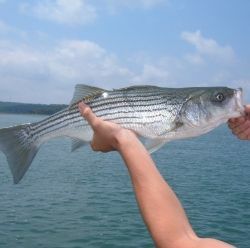 Striped bass usually hit the bait as it drifts downward near the bottom. By varying your casts—both in distance and angle of direction—you can thoroughly cover the target area before moving on to the next spot. When a striped bass hits the bait, let the line free spool as the bass starts it run. Point the rod towards the fish, and then quickly snap the bail shut and set the hook. Play and land the fish quickly, to allow a better recovery before releasing. 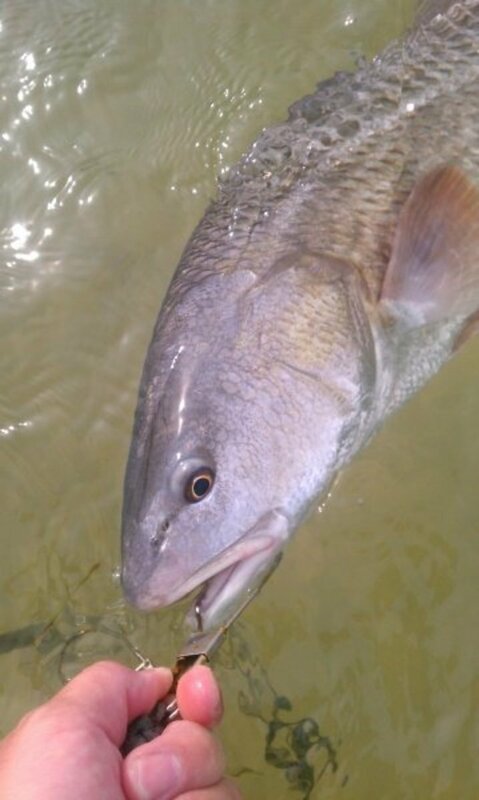 Circle hooks result in more lip hook-ups than traditional hooks and are swallowed less often, which helps to minimize injuries when catch-release fishing. The Cast-Drift-Retrieve technique to catch striped bass also works from an anchored or slowly drifting boat. 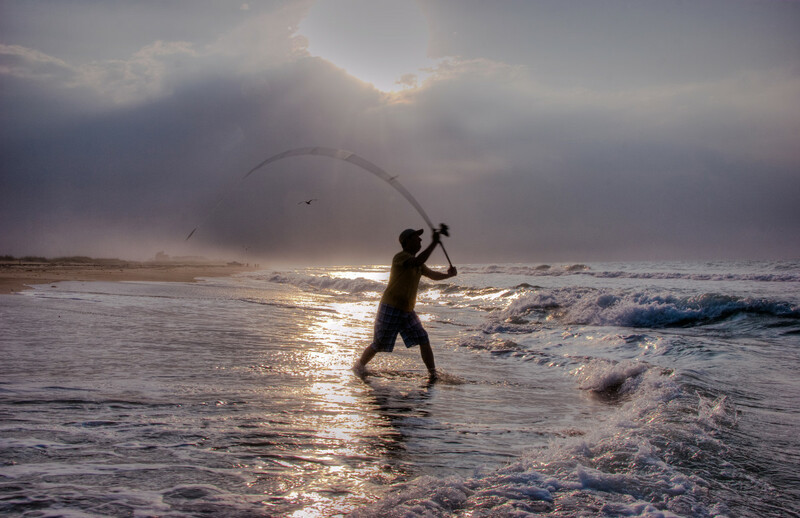 This can allow you to drift bait into areas you can't easily cast into, such as around piers and along rocky points where striped bass tend to congregate. Match the weight of the bait and tackle to the depth of the water and the speed of the current. The goal is to use as little weight as possible, yet drift the bait down into the striper's strike one. Clams. sand worms and squid can be effective baits for catching striped bass. The natural baits create a scent trail in the water that helps to attract hungry fish. Striped Bass Feeding Frenzy -- Check It Out! 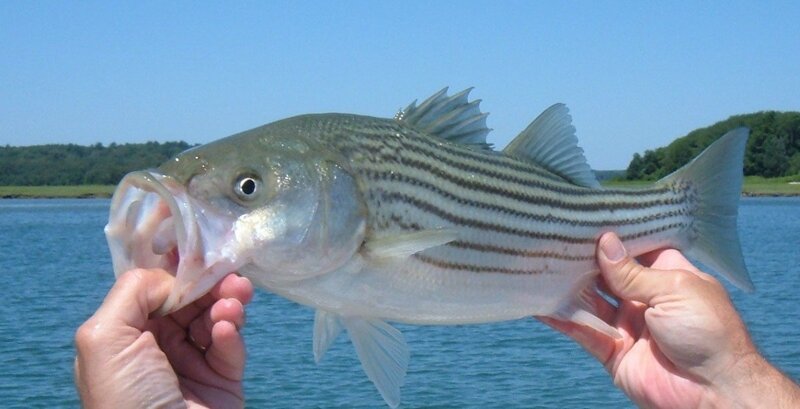 Most trophy-sized striped bass—fish measuring 50 inches or longer—are females. Known as cows, these large females lay many times more eggs than their smaller sisters and are essential to maintaining healthy populations of striped bass. Safely releasing large cows helps to ensure future generations of these spectacular fish for years to come. Successful catch-and-release fishing begins with your fishing tackle. Circle hooks are very effective and setting the hook properly usually results in catching the corners of the bass's mouth. Circle hooks are swallowed much less frequently than traditional hooks, saving unnecessary internal injury to the fish. Landing the fish quickly will help to keep the bass strong for a safe release. 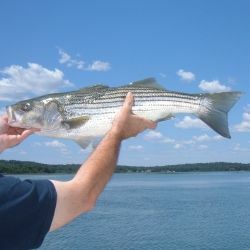 Grab the striped bass firmly by the lower jaw, and use your other hand to support the midsection of a large fish while lifting and holding it out of the water. Do not hold the fish by the gills. Use a hook extractor or pliers to remove imbedded hooks. Grab the hook as close to the point as possible, while gently yet firmly twisting and backing out the hook. Pliers or an extractor provide extra leverage without putting additional pressure against the fish. Return the fish to the water as quickly as practical. But keep in mind that releasing an exhausted and disoriented fish before it has time to recover is lethal. Hold the fish in the water by its tail while supporting the midsection, and within a few minutes, a healthy and uninjured fish will begin to regain its strength. Taking the time to allow a tired fish to recover fully before swimming off on its own will significantly increase its chances of surviving and fighting again on another day. 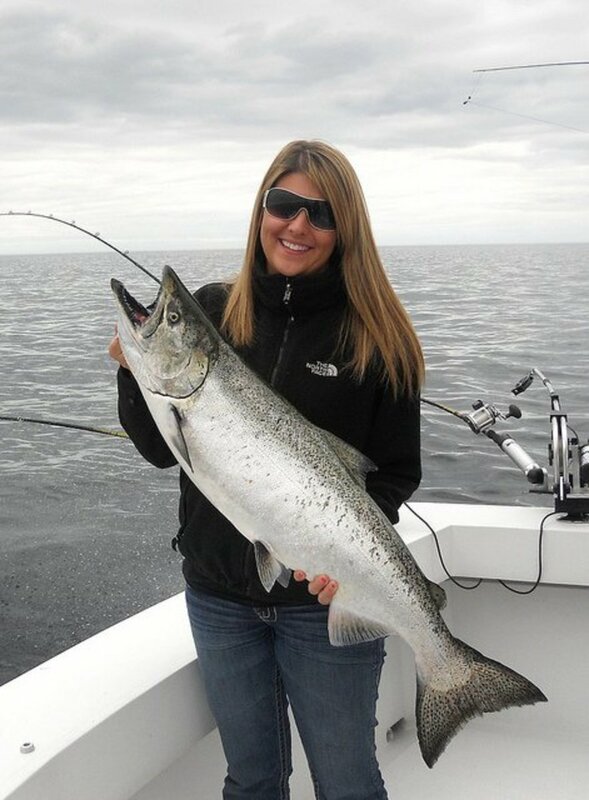 Are you in favor of Catch & Release Fishing? A female Striped Bass weighing 15 lbs is about 8 years old and lays over 1,000,000 eggs every year! Please Share Your Fishing Stories! Down here in Texas, they drift using live shad. I am intrigued by your "light tackle" technique as folks up here tend to use heavier gear. However, the Strippers here are, for the most part, stocked in resevoirs. I often wonder if this affects their natural behavior. I intend on employing this New England style on my next outing for stripper. Our lakes are also overrun with hybrids that spawn with our native sand bass. I fish the inlets too. Much better than the wasteland of the flat sandy beaches. Most of the time at least lol! Nicely done. 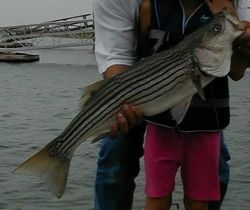 I have never caught a big striped bass, but maybe some day. Very nicely done. Wish there were more catch and release fishermen. Cast - drift - retrieve, and hopefully with a stripper attached....sounds like the perfect way to spend a day to me! I got 100% on your quiz...and this is 100% excellent and blessed!